Let’s be clear: I love dream pop and all that encompasses it, but every so often I can be torn away from the spacey aural percussion, swirling guitars, and hushed sing-speak to find something amazing in a completely different genre. Barling bills itself as: “Somewhere between Death Cab for Cutie and Avett Brothers, their hearts lie in storytelling and creating a moving experience that audiences can take home with them. Their songs are written from personal experience with honest observations and spiritual undercurrents.” Their genre tags are alternative country, Americana, and folk rock. 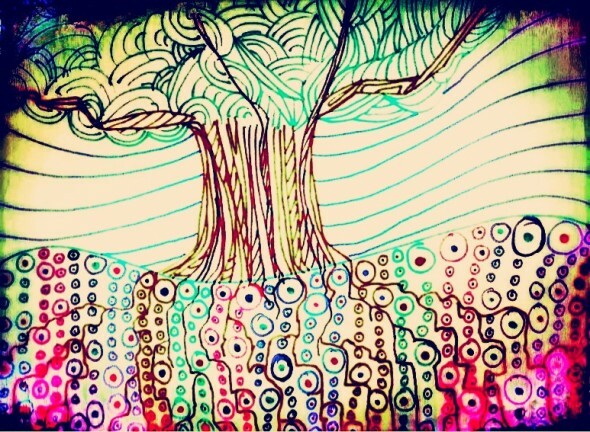 Did I doodle while listening to Barling? Yes, I did. I also played around with iPhone camera apps too. Sorry, I really did try to get away from psychedelia. But Colin Newman and I noticed this is pretty “rootsy” too. To that end, I talked to Nicholas Poss. He is the frontman for Barling. Below is the conversation we had about the band, the people in it, where they draw inspiration from, and where you can find them next. 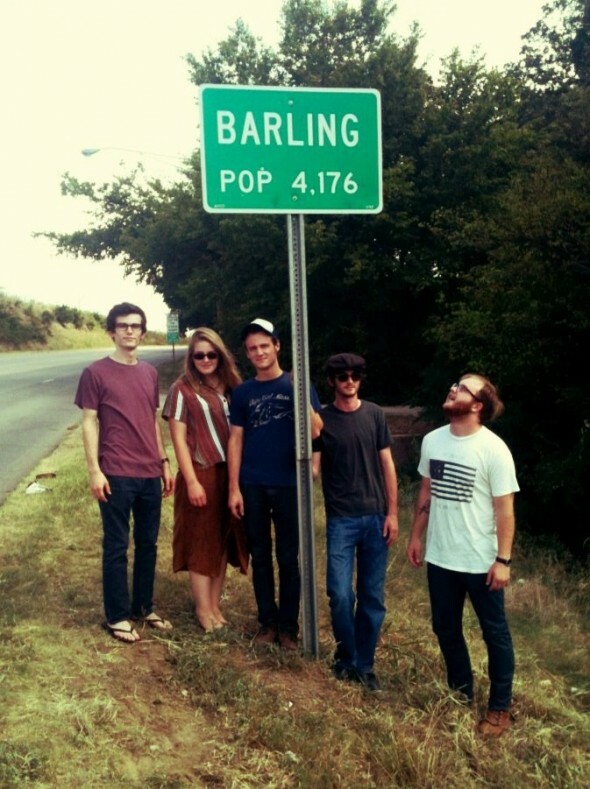 okc.net: Alright, so Barling, it’s a town and it’s the name of your band. Did someone grow up there, perhaps drown in a river, or ??? Poss: I’m sure someone has drowned in a river there, but we named our band Barling for another reason. After a series of indecently sexually suggestive band names I just asked everyone where they were born. Our percussionist/banjo player Tye Mauch was born in a town in Arkansas called Barling. That sounded a lot more like a band name then Tulsa. okc.net: So how far have you come as a band between the two releases? I ask because I’m pretty sure I hear a difference in the quality between the two recordings. Also Kelly’s voice reminds me of Dolly Parton. Ordinarily I dislike old Dolly, but Kelly is complimentary and not overpowering. That said, does she have any say in writing the lyrics she sings? Who’s responsible for the basic outline of a song? Poss:“Darling with a B” feels more like a band is playing as opposed to a couple of instrumentalist accompanying a songwriter. Not that there is anything wrong with that. The songs were written to accommodate for full-band arrangements, and the songs really do require that to be communicated effectively. Regarding production quality, “When I’m Lying” was recorded in a home studio in Tulsa, and “Darling with a B” was recorded at RCA in Nashville. okc.net: Is your voice naturally that emotive? I was listening “Old Framed Picture” and your opening lines sound, well, on the verge of a break down. Is this work, or does it come pretty easy? Poss: My voice has always kind of sounded that way. I try to use inflections that communicate what the words are saying. In the song “Old Framed Picture” the speaker is appealing for honesty because deception has made him an insecure, neurotic, angry person. I tried to communicate that immediately. okc.net: Contrast that with “River of Jordan,” which is jubilant for a murder ballad. All said, “Darling with B” is about a doomed relationship, what’s the inspiration behind this story? Did you guys watch a movie or read a book about a dysfunctional couple? I mean, the “tragic-ness” of their story suggests they should have used e-Harmony before hooking up. Poss: If there was one company I could choose to do a jingle for, it would be e-Harmony, just for the record. The new EP was inspired by my personal relationships and how all of them were complete failures. It was really an opportunity for me to excise my demons and rid myself of past relationship failures. okc.net: So really what’s the major difference in the heartbreak and woe on “Darling with a B” and “When I’m Lying”? Poss: I think “Darling with a B” is a more convincingly sad album. The full-band arrangements help communicate more clearly the intention of the lyrics, which aren’t as “in the moment,” but rather more observatory, and a bit more cynical. okc.net: Also is “Darling with a B” an EP or full, but short album? okc.net: Remember when I e-mailed you like at 3 a.m. a couple months ago and said you had a song that reminded me of Wilco? Yeah, I finally remember which song it was. “The Law.” It’d been the lyrics, “And what you thought was literature turned out to be the paper boy’s poetry, but it is clearly expressed convincingly, the necessities that are falling down.” I don’t know. It just seems like something Jeffy Tweedy would write. I guess it’s the lyrics to “Woodgrain” where Tweedy sings about not being a poet. However, sonically “The Law” is not discordant like “Woodgrain” nor does it have the same kinds of aural quirks. All that aside, you said you were flattered by the comparison, being a fan, but whose song writing skills inspire you lyrically? Poss: First of all, yes, we are all big fans of Wilco. Jeff Tweedy’s quirky left of center approach is really charming and at the same time emotionally disarming. I also love hymns from the primitive Christian church because they are pointed and communicate a clear purpose (see: Charles Wesley, Martin Luther, John Newton, etc.) Even from a secular viewpoint, they were very talented at communicating a complicated message clearly, simply, and effectively. I love the earnest and anxious energy of Phil Ochs’ lyrics. He sang songs that flew in the face of the government and the population at large without apologizing. The list goes on. okc.net: Flip side – who inspires your sound and is that a collaborative process between you and the other members of the band? Poss: A few of our band members have spent the past four years studying classical music at various universities, and that has undoubtedly affected things. We utilize extended instrumental techniques as well as harmonic dissonance to communicate our musical ideas. I had a professor say our music was like Schoenberg meets John Prine. That’s pretty much the aesthetic we’re going for. Chamber-inspired noise country. Also, we like to have a good time. Barling started as the fun, anti-school project for all of us, so that attitude will probably stick around. okc.net: So Norman Music Festival and the Bluebonnet stage, is this the band’s first time playing that venue and Norman Music Festival? Poss: We play the Blue Bonnet frequently and we love the venue and Norman Music festival. Last year we played at Michelangelo’s, but we always enjoy the good ol’ boy, honky-tonk vibe of Blue Bonnet. I think our music makes sense there. Because here’s the sad thing, I was listening to modern country the other day, my curiosity was peaked since I’d unplugged my phone from the car’s audio jack, and I wasn’t exactly impressed with what I’d heard. But I appreciate that you all aim to switch it up and give music more care and craft and, quite frankly, nuance in the lyrical and musical department. But thematically, I guess I’m just curious to know how far you plan to veer away from your contemporaries? Which isn’t to say you can’t sing of heartache and modern day snags in the traditional narrative of heterosexual relationships, some part of me has to believe there are gay and lesbian country songs out there, but is there anything in your lives that has spoke to you as individuals and as a band? Poss: We definitely intend on exploring some different subject matter in the next album. Will I still write songs about relationships gone awry? Probably, it seems to go hand in hand with writing music that’s personal, but we are intentionally making the next album’s subject matter more expansive. We really feel that our place in the world of country is on the outskirts. If I were talented in the same way that Garth Brooks or Keith Urban are, I would probably write that kind of music, but our band is more interested in exploring a more traditional country approach. We’re not trying to be a good band, because that’s been done before (winky-face). We are fascinated with the culture of Americana and it will always be an important part of our band’s identity. When a performer like Chet Atkins or John Fahey interprets the established aesthetic of his or her predecessors like The Carter Family or Blind Willie Johnson, the end result is fascinating. We are interested in the progression of traditionalism and that’s where I think our place in the country music scene is. You can catch Barling tonight in Edmond at the Credo Coffee House. But if you should miss them, worry not! They will play Norman Music Festival at the Bluebonnet Stage at 11 p.m. on Thursday April 25th. Check their Facebook page to keep tabs on them if you’re so inclined. Tagged EP, Jordan, lyrics, music, Nicholas Poss, okc.net, Old Framed Picture, Poss Darling, Tulsa, Tye Mauch, writing. Bookmark the permalink.